While Trump will continue to attract media attention with bizarre tweets, the nuts and bolts guys of the administration will get things done with their investigation. History is clear on what happens when either Mike Pence or Jeff Sessions get anywhere near a voter registration database. People unlikely to vote Republican, meaning mostly non-whites, will be removed from the rolls and people attempting to register them will be prosecuted. In the most recent election, Mike Pence oversaw an “investigation” by state police that halted a voter registration drive of rural mostly black voters. A Democratic party aligned group was working overtime to get voters registered and get them out to the polls. Out of the nearly 50,000 voters registered by the group, a total of 10 were found to have incorrect information. The group, which had registered voters in 9 then 47 and finally 56 counties, got raided because of a clerical error rate of 0.002%. The group's computers and thousands of completed voter registration cards were seized. This meant they thousands went unregistered and were unable to vote. The raid was timed so that the voter registration deadline was looming and the registered voters were blocked from voting. This is what a voter fraud investigation looks like when State Police answering directly to Mike Pence are involved. By my rough calculations, 13% of the State's Black Voters were disenfranchised in a single day to further an “investigation” while Pence was running for national office. Jeff Sessions, who once called a white civil rights lawyer a “disgrace to his race” will be the one to control Pence and Trump's promised investigation. Sessions' nomination to the federal bench by Ronald Reagan was famously derailed by his failed prosecution of civil rights notables for attempting to register voters in 1987. Now that he is the Senator from Alabama, he has the rest of the union to help him along. His outspoken racism, which reaches as far as calling the NAACP a “communist” organization and accusing the ACLU of “forcing civil rights down America's throat,” will likely also manifest itself in attacks on the voting rights of Latino citizens. Sessions is noted for his ongoing association with White Nationalist John Tanton who once said “I’ve come to the point of view that for European-American society and culture to persist requires a European-American majority, and a clear one at that.” Tanton founded the anti-immigrant hate group Federation of Americans for Immigration reform. Sessions regularly attends meetings of that group. Sessions was the keynote speaker at their 2007 annual advisory board meeting. The hate group's membership roles are private so Session's actual dues paying membership can not be determined. Sessions' eventual confirmation as attorney general is assured. Democrats have already broken ranks to reach across the aisle and shake hands on his upcoming tenure. Joe Manchin (D-WV) has said “Jeff Sessions has my vote. He’s my friend. I’ve built relationships and friendships here.” Manchin holds the Senate seat last occupied by former KKK exalted cyclops Robert Byrd. Manchin's daughter is the CEO of Mylan, a drug company recently castigated for it's tax dodging and price gouging. While Hillary Clinton stuttered about the campaign trail when America remembered her calling black teenagers “super predators who must be brought to heel,” racist voter intimidation was already taking place in her running mate's home state of Virginia. While Tim Kaine flailed about in his vice presidential match up against Mike Pence, State Police were busy intimidating black voters. State Police went door to door in black neighborhoods to inform residents that is was a crime to vote if their paperwork was not correct. This was direct voter intimidation and deeply reminiscent of the Jim Crow era. Kaine, a former Governor, failed to defend his constituency, his party and his candidacy. As a leading Senate Democrat he can be expected to do more of the same in the future. The future is what this investigation is planning for. Trump officially filed his campaign paperwork for re-election the day he was inaugurated and has already begun raising funds for 2016. 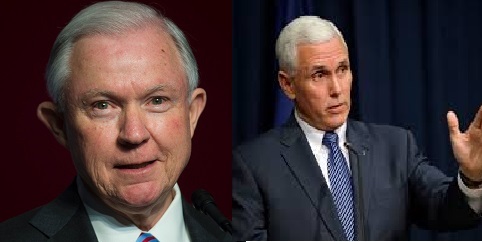 Thus both Pence and Sessions have a direct interest removing and intimidating as many voters as possible over the next four years. Trump's reelection will be a landslide and you will have no say in it.